Meave is holding parts of a modern human ulna with which to make comparison with some of the pieces of the specimen. 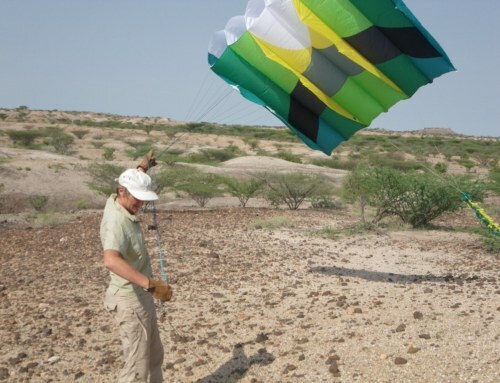 The Koobi Fora Research Project is back in the field again this year. Its been busy and exciting so far so finally a few posts from the field season. 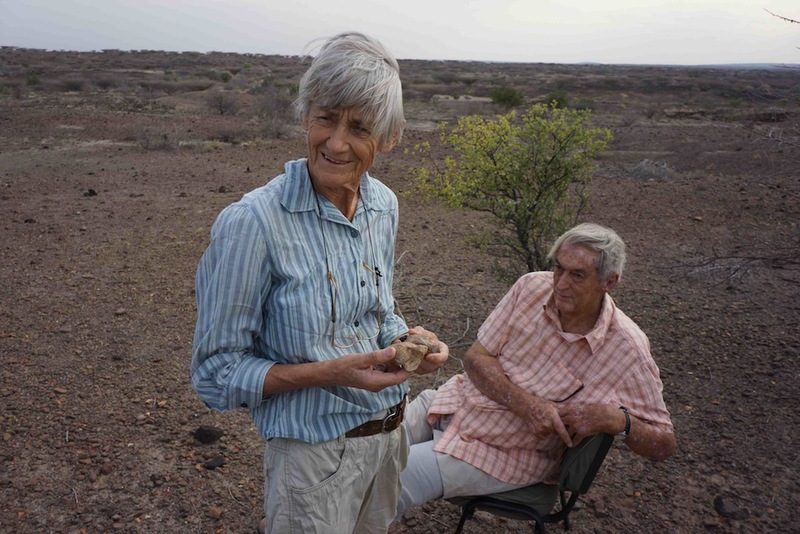 With one good fossil coming out of the ground already it prompted a visit by Richard Leakey who came and watched the proceedings for a morning. We are currently working to the south east of Ileret in Area 13 again and the team have a small and simple camp there, about an hours drive from Turkana Basin Institute at Ileret. The camp was established in the middle of June and the team have once again, found many good fossils on their forays. This area is particularly rich in associated remains of limb bones and other skeletal parts of a number of different animals. There are several outcrops of volcanic ash, dated to approximately 1.8 million years and the fossils are coming from sandstone levels that are both above and blow this horizon. Excellent geologist Professor Frank Brown, from University of Utah pictured here with Cyprian Nyete from our team, looking out over the fossil exposures and possibly discussing the location of tuffs and sandstones. 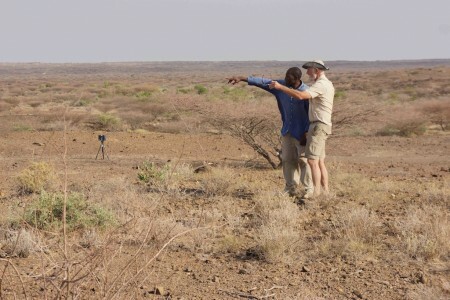 Geologist Professor Frank Brown, from University of Utah pictured here with Cyprian Nyete from our team, kindly spent a couple of days in this area to measure the geological section and place the two hominid sites for us. Last year we recovered several parts of a homind skeleton from this area. A large excavation and screen was done to sift through the sediment with the aim of finding for more pieces. It’s a work in progress and we will have to extend the area to sieve at this initial site. When we left last year it was left well protected as we covered it with many stones to prevent further erosion. 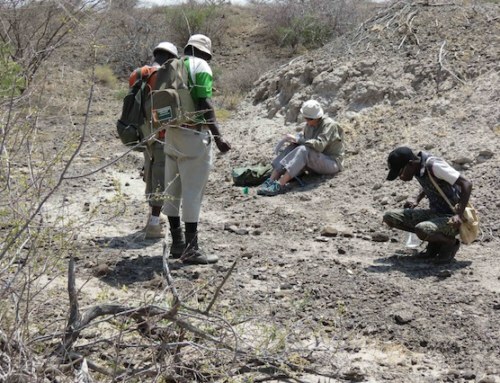 The field camp is not well protected from the wind and sadly there are no large trees nearby to camp under for shade but its very convenient with easy access to the sites to search for fossils. 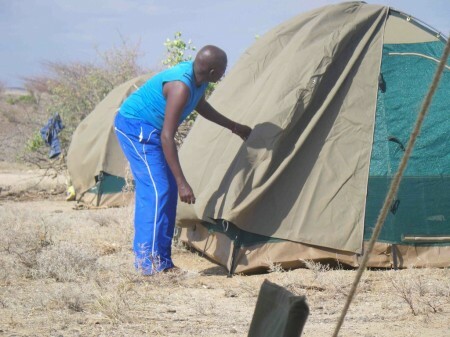 The camp is very basic, comprising several dome tents to sleep in as well as a shaded fly sheet as a dining area. Here is a dome tent that serve as a sleeping tent for two of the field crew.